Will Duck Cook Google's Goose? We all love an underdog. Whether it's David taking on Goliath in the Slingshot Competition or tiny Finland fighting Mother Russia, we all feel a certain kinship with the little guy. This quirk of our humanity may at least partially explain why in the battle of the Search Engines, we're rooting for DuckDuckGo. Isn't that a kid's game played during recess? Nope. That's Duck Duck Goose. DuckDuckGo is a teeny-tiny, privacy-focused online search engine who is going up against Google, the undisputed giant in search services with an estimated 68% of market share. Our society has embraced Google so enthusiastically; we have even added such words as "googling" to our dictionaries. There is no such similar verb for using DuckDuckGo yet but that may be where the trend is taking us. Although the DuckDuckGo search engine, founded by energetic entrepreneur, Gabriel Weinberg, has been fairly slow to hit the radars of the cybernautic masses, it appears to be taking off recently in a big way. According to DuckDuckGos own About Page, it took DuckDuckGo five years to go from zero daily users on Leap Day in 2008, to 1.5 million daily Duckers by June of 2013. Now, Internet industry sites such Search Engine Journal are reporting DuckDuckGo experienced an increase in daily searches since then to where it is currently topping 10 million. This is still fairly minor compared to Google, of course, which boasts daily searches of a staggering 3.5 Billion, or about 40,000/second. In other words, it only takes Google a little over 4 minutes to accrue the DuckDuckGo's current daily figures. 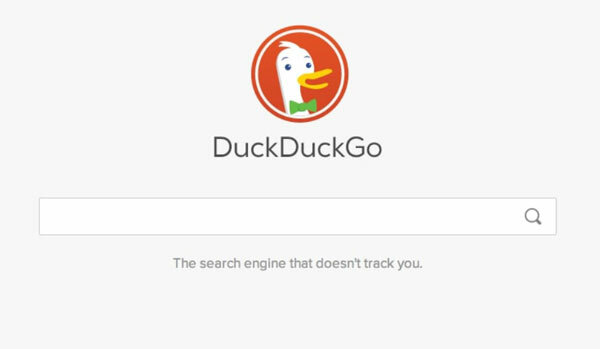 The likeliest reason for DuckDuckGo's recent popularity surge is that people are finally starting to understand what it means for Google to track their online activity. They have begun to notice, for example, when they search for anything in the web, suddenly they are being shown ads for products related to their searches. If you "google" pink eye, suddenly your monitor features Facebook ads for sty medications. Google explains their tracking programs are not meant to merely stalk you for fun but is a method of learning as much about you as they can, so they can tailor your search results to your unique needs. Their little spybots watch where you go and what you do so they can ply you with ads for products you are most apt to be interested in. DuckDuckGo, on the other hand, does not track anything. They feel where you go and what you do online is your business, not theirs and such, is not part of their business model. They understand only too well the common web truth that "If you're not paying for what you consume online, you are not the customer, you're the product". Not everyone wants to be a product. For those that grew up with Google, switching to an alternate provider is a little scary with a dash of separation anxiety. The familiar Google format and color scheme are, of course, goneentirely; replaced with something... well, just different. Once you get used to the different appearance and color-scheme of the site, however, its charms begins to grow on you. What is there to like about DuckDuckGo? In a word, plenty. Besides the most important fact that this Internet search website doesn't try and wrest all your personal information from you for their files*, there is still lots more to like about the service. *Not just their files but also the files of their advertising clients, government spooks and whatever other entities Google deem fit and/or profitable to share with. One aspect of Google's aggressive personal data-gathering model which customizes a user's content, is that this feature can create an "echo chamber of thought". This means users are increasingly only exposed to opinions, politics and concepts that are already mirrored in their own minds. This doesn't allow them to form new opinions; but rather it hardens the validation of our own already-held biases. If one questions if the "echo chamber" exists or if it has any effect on our society, one need only look at the increase in political polarization that has been increasing exponentially since Internet surfing became an everyday activity. Some experts even warn that Google's business model in the wrong hands could easily change the outcome of regional and national elections. Another unexpected side effect of Google's commitment to customizing our search results to our own specific needs is that Google search results may different for everyone, even if they use identical search terms. This may be problematic if someone wishes to explain to another person how to find something in Cyberspace. "Just google 'latest election polls'" you might say to your friends, hoping to show them, not realizing the content shown your liberal-leaning buddy will be quite different for your conservative-ish friends. One more feature that makes DuckDuckGo different from its Goliath-like competitor is Duck results are displayed as one long, continuous page, rather than the chopped up display of Google which shows off just a short list of ten or so site suggestions. Google uses this quality to force companies to vie for the first page, to their monetary benefit, of course. They act as if pages 2 to 2,000,000,000 either don't exist or don't matter. DuckDuckGo search is much more seamless. Google is more than happy to customize your search for you by monitoring your every online move, so they may add to the dossier they're compiling on you and all their other users. Duck customization, on the other hand is user-controlled, not search engine controlled. With their "Bang" option, one can simply add an ! to your search terms to be able to find what you were looking for within a specific chosen site directly. You can even customize your DuckDuckGo "bang" sites to create your own, personal list or just use the thousands of already-existing ones such as !w (Wikipedia), !yt (YouTube) and !ebay. While most of us want to repeat our successes, this is not the case with search engines. A major flaw of Google is that, depending on the search you embark on, may return results that are all directed at the same URL. Duck does not issue the duplicate listings which means you still get all the results you want but don't get redundant returns which clog up your results list. While giving the Duck a go for the past couple weeks, I did see areas where Google definitely has an advantage. For a free, albeit superficial translation service, DuckDuckGo has nothing like Google Translate. Mind you, if you do a Duck search for "translate", the second result is Google Translate so away you go. Plus, DuckDuckGo's driverless car is still likely decades, if not centuries away. Will You Try Ducking Yourself? You may want to consider it. Google's CEO, Larry Page, describes the perfect search engine as "something that understands exactly what you mean and gives you back exactly what you want." It is worthy of note Mr. Page makes no mention of assurance of privacy in his description. If privacy matters to you, maybe trade your Google for a Duck.